Ed Harris is a bald, blue-eyed, dashingly handsome movie actor, known for memorable character roles in such films as Apollo 13 with Tom Hanks, Places in the Heart with Sally Field, and The Rock with Nicolas Cage and Sean Connery. Harris grew up in a middle-class family in a middle-class town, and describes it as his Leave It to Beaver childhood. His father ran a bookstore, and had briefly been a singer with the Fred Waring chorus, and a background vocalist on TV's Perry Como Show. Young Harris was a two-sport star in high school, playing baseball and football, and he played both sports at Columbia University, but at only 5'9'' and unable to hit the fastball, he was no collegiate star. He studied drama and began his career as King Arthur in an Oklahoma City production of Camelot, while working day jobs as a house painter and service station attendant. When he first came to Hollywood, he rented a garage and lived in it for $25 a month until he was evicted, unable to pay the rent. He worked in local plays, but the pay was minimal or less, and he auditioned for dozens of bit parts on television shows but was repeatedly rejected. When he was finally chosen for a small part on an episode of the now-forgotten 1976 series Gibbsville with Gig Young, he started crying as he left the audition. After a few small roles on television, he made his film debut in 1978, playing "Pathology Resident #2" in Coma with Geneviève Bujold and Michael Douglas. In his first substantial part he smuggled illegal immigrants across the Borderline with Charles Bronson. His first starring role was in the virtually unreleased 1981 drama Dream On! with Paul Reubens, and his breakthrough came playing John Glenn in The Right Stuff with Sam Shepard as Chuck Yeager. 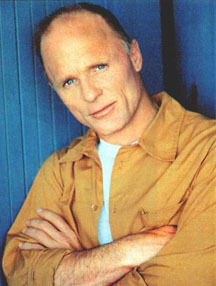 Harris shifts nimbly from character actor to leading man, but has had more success in supporting roles, including Glengarry Glen Ross with Jack Lemmon, The Truman Show with Jim Carrey, A Beautiful Mind with Russell Crowe, The Hours with Nicole Kidman, and A History of Violence with Viggo Mortensen. As leading man, his best work includes the wet science fiction The Abyss with Mary Elizabeth Mastrantonio, the thriller Enemy at the Gates with Jude Law, the sainthood saga The Third Miracle with Anne Heche, and his own acclaimed directorial debut, the Jackson Pollock bio Pollock. He has occasionally returned to the stage, winning an OBIE for his 1983 performance off-Broadway in Fool for Love with Kathy Baker, and he won Drama Desk and Theater World Awards for his 1986 Broadway turn in Precious Sons opposite Judith Ivey. He has been called one of the sexiest bald men alive, and he has been Oscar-nominated four times, but has not yet won. He met his wife, actress Amy Madigan, in 1981, when they appeared together in a Los Angeles production of the play Prairie Avenue. They co-starred in the Vietnam survivors' drama Alamo Bay and an excellent western made for TV, Riders of the Purple Sage. They also worked together in Places in the Heart.